For some time I have wanted a small camera that I could easily put in my pocket and have with me anytime anywhere. The problem is that a number of the cameras that I have looked at are either too big and don't fit the 'pocket' category or don't have the quality I need if I were to submit the images for publication. I feel like why carry something around if in the end you'll only end up with a snap shot that you can't use. It might help me remember the moment but it may just as well help me remember the moment I didn't bring my SLR. Enter the Ricoh GRD III. Folks, this is one powerful little machine. And my little I mean just that. ...and about 2 AA batteries thick. But in that package you get an f1.9, 28mm lens, 3648x2736 RAW files, full manual control (including a pop up flash that will operate manually and synch with the rear 'curtain'), average, center weighted, and spot metering, 'manual' selective focus and macro, all in a solid magnesium (not plastic) body. One of the first days I had the GRD III, I took it on a walk through the alleys of KL's Chinatown. What I liked about it was how 1.9 lens handled low light without the need to crank up the ISO. Both of the above shots were at ISO 200 in a covered, unlit alleyway. Because it's small it's great for street photography. And handy around the house for pet photography.. It also has a nice macro function. The GRD III also comes with a hot shoe mount. I took it out with me on an assignment where I am shooting the music scene in KL. Below I'm synching two Canon flashes with Pocketwizards 'just like the big camera'. I'm still in the 'test drive' stage ( I don't own the camera nor am I being paid to say nice things about it) but so far it is doing everything that I had hoped for from a pocket camera. A few niggling points. The GRD III has a 4X digital zoom but unfortunately it does not work in RAW only JPEG so you need to switch to JPEG if you want to use that. It also has a 'dynamic range' (which allows for an expanded tonal range by taking two photographs of the same subject) and 'skew correct mode' (that corrects angular distortions in door frames, ect. caused by wide angle lenses) but unfortunately neither of these functions work in RAW. Small points and in the end not deal breakers. In all, I have to say I am much more impressed than I was initially prepared to be. The image quality is excellent, the menu is straight forward, it's well built and incredibly compact. Check it out if you are in the market for a compact (or even SLR) camera. I was looking for same a while back - a pocket size camera that gave me the manual control I was used to from my DSLR, RAW image files which I find more flexible and quicker to process and decent image quality, of course. In the end I went with the Canon S90 which is proving popular; I notice many friends with the same model. I don't find it quite as good in low light as I'd hoped, though it's not bad at all. Other than that, I'm really happy with it. Looks great! I've been toying with the idea of getting another pocket sized camera for a while now but didn't want to give anything up that I use on my dslr. I think you've sold me. Are these photos not retouched at all? They look great. Kavey - I know a few people with the S90. Sounds like a good option as well. Considerably cheaper than the GRD III. Aaron - As I said, I was prepared not to like it. I'm still missing real manual focus (which no pocket camera has yet to offer) and a viewfinder (I have the optical viewfinder that slides into the hotshoe but it's not quite the same). But other than that it will do most everything the SLR will. Catherine - A little contrast boost but that's it. The image quality is really outstanding. Hmm. Food for thought! I have been using a Panasonic Lumix DMC-FX07 (with Leica lens) for a while and had nice results, but the lack of full manual has irked me, along with the excess noise in low light. I'm just waiting for it to die so I can upgrade. I can't get used to non opticaL viewfinders, I just can't get on with digital ones as my only option. My first digital camera, many years ago, was a Minolta (that was also what my SLR was at the time) and in the end, the digital viewfinder was one of the main reasons I didn't use the camera much, though lack of manual control over many aspects of the image was also a factor. But I have to say, image quality really does look very good! Kitt - Take a look at this when you're ready to upgrade. It's a solid competitor. Kavey - I agree, it is taking me some time to get used to the optical viewfinder, in fact I'm not really using it much. My horizons seem to slant when I use it. On a plus note people seem to react better to me when I use the viewfinder than the LCD screen. Maybe they like the fact that my face is covered? I'll try not to take it personally. Dave, would love your take on the Lumix LX-3 or the newest LX-5 if you've had a chance to use either. A bit more flexible (optical zoom) still fast glass and 720p HD. Hey Gen - Yeah, I'd like to give it a whirl (subliminal message - CHRISTMAS IS JUST AROUND THE CORNER). Forgot to mention that the Ricoh shoots 720p HD video as well (a feature I've yet to dive into, even with my Canon 5D Mark II). I do hear good things about the Lumix. There's a lot of choice out there these days which means I can't blame crappy pictures on the camera anymore! Do you own the Lumix? I'd like to hear from people what they use and what they like and don't like about their current systems. What do you think of the G11? Im liking the Lumix-LX3; it does RAW and can handle F2.0, uses a Leica Lens. It too is quite popular although you have to remove the lens cap. For a full analysis I relied on dpreview.com. 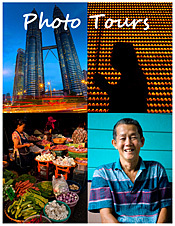 I'm tempted to take your photographers tour if I get to Malaysia - to improve my eye! Lina - From what I've seen the G11 is a contender. It's a little bigger so not as 'pocketable' as the GRD, but it does have viewfinder which for me is a plus. Bobster - Heard good things about Lumix, too. Drop me a line if do plan to come to KL and I can give you the details of the walks.